BACKGROUND AND PURPOSE: Patients successfully treated with vertebroplasty often return with new pain caused by a new vertebral body fracture. The new fractures often are adjacent to the vertebral bodies that were initially treated. In our clinical work, we have observed that cement leakage into the disk increases the risk of new fracture of the adjacent vertebral body. This study analyzed the risk of new fractures of adjacent vertebral bodies in relationship to cement leakage into the disk. METHODS: This study was based on 38 patients with painful compression fractures treated with vertebroplasty. Patients who returned with new pain after initial successful vertebroplasty were evaluated by repeat MR imaging. We analyzed the incidence of new fractures of adjacent vertebral bodies in relationship to cement leakage into the disk that had occurred during the initial vertebroplasty. RESULTS: Fourteen patients developed new fractures during the follow-up period. In 10 patients, the new fractures were associated with cement leakage into the disk, whereas four patients had new fractures that were not associated with cement leakage into the disk. This difference was statistically significant (P = .018). A detailed analysis showed that 58% of vertebral bodies adjacent to a disk with cement leakage fractured during the follow-up period compared with 12% of vertebral bodies adjacent to a disk without cement leakage (P < .0005). CONCLUSION: Leakage of cement into the disk during vertebroplasty increases the risk of a new fracture of adjacent vertebral bodies. Vertebroplasty was introduced into the literature in 1987 (1), and multiple studies have documented the effectiveness of the procedure for relieving or decreasing pain caused by vertebral body compression fractures (2–8). Cement leakage outside the treated vertebral body is relatively common but is generally of no clinical significance (3, 4, 6, 8); however, cement leakage into the spinal canal or neural foramina may cause new symptoms and may require decompressive surgery (3, 7, 9). In our clinical work, we have often seen initially successfully treated patients returning with new pain caused by new fracture. This has been documented in several previous studies (4–6, 10), and in our clinical experience, approximately 25% of our patients have developed a new painful fracture during the first 6 months after initial vertebroplasty. The new fractures often affect vertebral bodies adjacent to the ones initially treated. It has been discussed whether this is a progression of the underlying condition or a result of the increased stiffness of the treated vertebral body (3, 10). We have observed multiple incidents of cement leaking into the disk during initial vertebroplasty. Many of these patients have returned with new painful fractures of the adjacent vertebral bodies. Based on this observation, we have postulated that cement in the disk may increase the risk of a subsequent fracture (1, 3). Others have associated cement leakage into the disc with complete pain relief (11, 12). 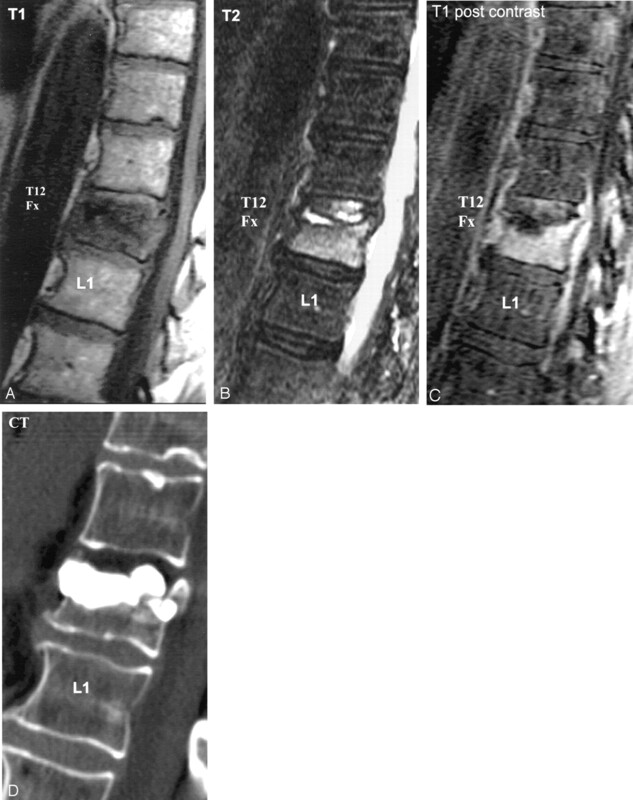 The purpose of this study was to evaluate the risk of subsequent fractures of adjacent vertebral bodies in relationship to leakage of cement into the disk during initial vertebroplasty. This retrospective study was based on a consecutive series of 38 patients treated with vertebroplasty. We treated a total of 96 vertebral bodies during a period of 34 months. The patients ranged in age from 45 to 94 years, with a mean age of 76 years (Table 1). The indication for vertebroplasty was compression fracture causing significant back pain that was not relieved with conservative measures. Before vertebroplasty, 15 patients were evaluated with MR imaging, four with bone scanning, and 19 with both MR imaging and bone scanning. The cause of the fracture was osteoporosis in 32 patients and neoplastic disease in six patients (Table 1). After the procedure, the patients were followed up with phone calls at 1 week and 1, 6, and 12 months. Patients who developed new pain were called back for repeat MR imaging and physical examination. Percutaneous vertebroplasty was performed in a biplane angiographic suite. The patients received midazolam (Versed; Roche Pharmaceuticals, Puerto Rico) and fentanyl (Sublimaze; Abbott Laboratories, Abbott Park, IL) for conscious sedation. During conscious sedation, the blood pressure, heart rate, and pulse oxygenation were continuously monitored. The patient was placed in a prone position on the fluoroscopy table. After local anesthesia was induced, two 13-gauge bone biopsy needles (Cook, Bloomington, IN) were advanced to the anterior third of the vertebral body by using the bilateral transpedicular approach under fluoroscopic guidance. Methylmethacrylate monomer powder (Cranioplastic; Codman, Rayham, MA) was mixed with 1.2 g of tobramycin (Nebcin; Eli Lilly, Indianapolis, IN) and 12 g of barium sulfate powder (Biotrace; Bryan, Woburn, MA). The liquid methylmethacrylate polymer was mixed with the powder to a texture of dough. Under biplane fluoroscopic guidance (primarily lateral), the cement was injected alternatively through the left and right needle by using 1-mL syringes. We injected as much bone cement (polymethylmethacrylate) as possible and stopped when cement reached the posterior 20% of the vertebral body or when significant leakage occurred. If leakage was suspected, we stopped the injection temporarily and continued when there was no significant leakage into the paraspinal or disk area. If epidural leakage occurred, the injection was stopped and not attempted again. The patients remained in the recovery unit until the effects of anesthesia wore off. Postprocedural CT scans were obtained at the treatment levels, using a 1.25-mm section thickness and a 0.6-mm overlap. The distribution of cement was documented with axial view thin section CT scans and with sagittal and coronal view reformatted images. Cement leakage into the disk was classified as cement leakage or no cement leakage. Within 2 to 3 hr after the procedure, the patients were discharged home. It was recommended that they resume normal daily activities as tolerated but avoid lifting objects heavier than 5 lb and avoid any significant spinal flexion. Physical therapy was not routinely administered. Patients who developed new pain during the follow-up period were brought back for MR imaging of the thoracic and lumbar spine. Unenhanced T1- and T2-weighted imaging and T1-weighted fat suppressed contrast-enhanced imaging were performed. The same protocol was used both before and after the procedure. Patients who did not develop new pain did not undergo repeat MR imaging. We analyzed the incidence of new fractures in relation to cement leakage into the disk in two ways. The first analysis was based on the number of patients, and the second analysis was based on the number of disks opposing an adjacent vertebral body that could potentially fracture. With the first analysis, we compared the incidence of new fractures in patients with cement leakage into the disk with the incidence of new fractures in patients with no cement leakage into the disk. With the second analysis, we calculated the incidence of new fractures of adjacent vertebral bodies and correlated it to cement leakage into the disk. Because each treated vertebral body has two disks, there were 192 adjacent vertebral bodies. We excluded 83 adjacent vertebral bodies that had been previously treated or had old fractures. These 83 vertebral bodies did not have the potential to fracture. Thus, there were 109 disks separating newly treated vertebral bodies from adjacent vertebral bodies that had no previous fracture or treatment that could potentially fracture. Fisher exact test and Student’s t test were conducted for statistical analysis. P < .05 was considered statistically significant. We also estimated cement volumes in the disk by using reformats of post-vertebroplasty CT scans and categorized them as minimal and large volumes. We determined whether there was any relationship between cement volume and the incidence of new fractures. We identified new fractures in 14 of the 38 patients during the follow-up period. Ten patients had new fractures associated with cement leakage into the disk, and four patients had new fractures not associated with cement leakage into the disk (Table 2) (Figs 1 and 2). This difference was statistically significant (P = .018). Images of an 85-year-old woman with back pain. A, Pre-vertebroplasty sagittal view T1-weighted MR image shows bone marrow edema of T12. B, Pre-vertebroplasty sagittal view T2-weighted MR image shows bone marrow edema of T12. C, Sagittal view contrast-enhanced T1-weighted MR image shows enhancement, indicating an acute T12 compression fracture. D, Post-vertebroplasty sagittal view reformatted CT scan shows cement leakage into the T11–T12 disk. E, Sagittal view T1-weighted MR image obtained 15 days later, when the patient returned with new pain, shows new bone marrow edema of T11. F, Sagittal view T2-weighted MR image obtained 15 days later, when the patient returned with new pain, shows new bone marrow edema of T11. G, Contrast-enhanced sagittal view T1-weighted MR image shows T11 enhancement, indicating a new acute T11 fracture. Images of a 79-year-old man with back pain. A, Pre-vertebroplasty sagittal view T1-weighted MR image shows bone marrow edema of T12 and L1. B, Pre-vertebroplasty sagittal view T2-weighted MR image shows bone marrow edema of T12 and L1. C, Sagittal view contrast-enhanced T1-weighted MR image shows enhancement, indicating acute T12 and L1 compression fractures. D, Post-vertebroplasty sagittal view reformatted CT scan shows cement leakage (arrow) into the L1–L2 disk. Of note, leakage of cement into the T11–T12 disk also occurred. However, T11 was treated with vertebroplasty at the same time as T12 and T11 therefore could not be evaluated for a possible new fracture. E, Sagittal view T1-weighted MR image obtained 25 days later, when the patient returned with new pain, shows a focal area of new bone marrow edema of L2 (arrows). F, Sagittal view T2-weighted MR image obtained 25 days later, when the patient returned with new pain, shows a focal area of new bone marrow edema of L2 (arrows). G, Contrast-enhanced sagittal view T1-weighted MR image shows enhancement, indicating a new acute focal fracture of L2 superiorly. The new fracture (arrows) is located immediately adjacent to the cement leakage into the disk. For 19 of the 109 disks, cement leakage separated a treated vertebral body from an adjacent vertebral body that had no previous treatment or fracture (ie, one that had potential to fracture). Fifty-eight percent of these 19 vertebral bodies fractured during the follow-up period compared with 12% of the vertebral bodies adjacent to disks without cement leakage (Table 3). This difference was also statistically significant (P < .0005). The average time between vertebroplasty and new fracture was 48 days in patients who had leakage of cement into the disk and 98 days in patients who did not have cement leakage into the disk. This difference was not statistically significant (P = .06). Eight of the 11 new fractures related to cement leakage into the disk were located immediately adjacent to the endplate neighboring the cement leakage into the disk (Fig 2). No significance was observed between new fractures and larger cement volume or cement contact with the vertebral body (P > .10). We identified a statistically significant increase in the incidence of new fractures after cement leakage into the disk during vertebroplasty. New fractures occurred more often and at an earlier time than did fractures in cases with no leakage of cement into the disk. This confirmed our clinical impression and the speculations we had made based on previous studies (1, 3) suggesting that patients with cement leakage into the disk are at a higher risk of developing subsequent fracture. We think that the mechanism for the new fractures is a combination of the underlying condition, mainly osteoporosis or neoplastic disease, and the hard cement in the disk. In eight of the 11 cases, the new fracture was immediately adjacent to the cement in the disk (Fig 2). The immediate adjacency of the cement and the new fracture is a strong indication that the hard cement results in an increased mechanical pressure, eventually causing a new fracture of the endplate in the adjacent vertebral body (Fig 2). The increased mechanical pressure is especially pertinent for patients who increase their daily physical activities as their back pain decreases after vertebroplasty, placing additional stress on the vertebral bodies. 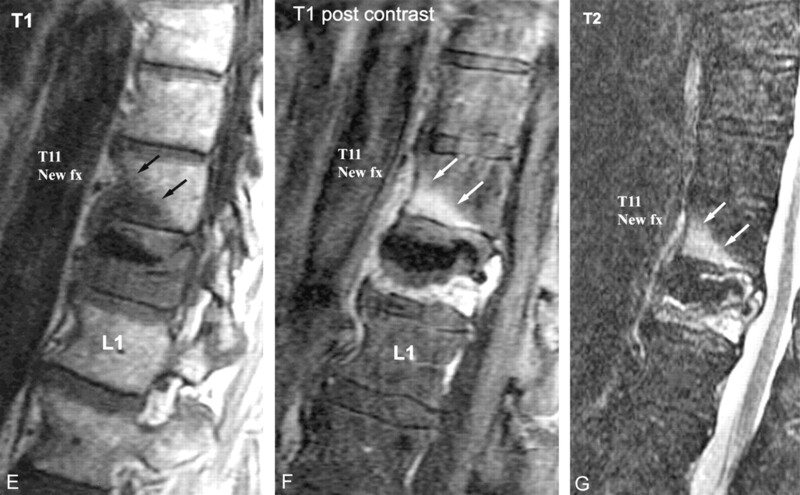 For example, as shown in Figure 2, cement leaked into the L1–L2 disk during vertebroplasty of L1 and later caused a fracture of L2 inferiorly. The MR images obtained when the patient returned with new pain showed bone marrow edema and contrast enhancement. These abnormalities indicated a new fracture. The edema of the superior endplate was thought to be caused by the direct pressure of the hard cement. Edema of the lower half of the L2 vertebral body was also present. This was probably caused by a more generalized compression fracture of L2. We analyzed the association between the total amount of cement injected during vertebroplasty and the incidence of new fractures but could not identify a statistically significant relationship. Neither could we appreciate a statistically significant relationship between the amount of cement that leaked into the disk and the incidence of new fractures. Because of the limited number of patients in our study, the association between the total amount of cement injected, the amount of cement that leaked into the disk, and new fractures must await the results of further studies. It is obvious that attempts should be made to reduce the incidence and the amount of cement leakage into the disk during vertebroplasty. There are several ways this can be accomplished. Peh et al (11) suggested that in a centrally located fracture, the needle tip should be placed laterally and away from the center of the vertebral body to reduce the risk of cement leakage into the disk. The consistency of the cement (12) and the volume of cement injected (12–14) can also be appropriately adjusted to reduce leakage. Although cement consistency and leakage has not been well studied, more viscous cement may be less prone to leak (12). Smaller volumes of cement may also decrease the risk of leakage (12–14) and probably still provide sufficient stability (14). As a final precaution, cement injection should be stopped immediately after detecting leakage into the disk (1, 3). Injection may be resumed after the cement has slightly hardened. Clinicians have discussed prophylactic treatment of vertebral bodies in patients with severe osteoporosis or metastatic disease. At this time, no evidence supports the prophylactic treatment of adjacent vertebral bodies, even if cement leakage has occurred into the disk. The prognosis for the treatment of a nonfractured vertebral body is unknown, and this approach should not be undertaken until we have clear evidence that prophylactic treatment improves long-term outcome. Cement leakage into the disk during vertebroplasty increases the risk of subsequent fractures of adjacent vertebral bodies. Noonan PT. Disk-space RMMA leakage during vertebroplasty: a prediction of significant pain relief. In the proceedings of the 2002 annual meeting of the ASNR, Vancouver, B.C. Accepted after revision May 16, 2003. Is Vertebral Augmentation the Right Choice for Cancer Patients With Painful Vertebral Compression Fractures?